Cape Town – The unwelcome severity of Quinton de Kock’s ankle injury has given the Proteas’ brains trust some fairly urgent head-scratching to do in both Test and limited-overs terms. South Africa’s wunderkind, who turned 22 only three days back, was on Saturday revealed to have done ligament damage in his warm-up mishap on Friday, ahead of play in the first Test against West Indies at Centurion. The No 1-ranked Proteas, powered by an irresistible six-wicket salvo of classic pace bowling from Dale Steyn, crushed the hapless visitors’ follow-on resistance in just over half a brutal session on Saturday for a massive win by an innings and 220 runs. 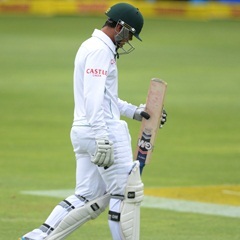 But the triumph was tempered a bit by the revelation that batsman/wicketkeeper De Kock has been ruled out of all remaining tour combat – Test, ODI and T20 – against the Windies and is also racing against time to be fit for the start of the World Cup in Australasia in mid-February. His injury apparently requires anything between six and 12 weeks of recovery, and it is some eight weeks until the Proteas, who might well anticipate the left-hander being one of the emerging stars of the tournament, open their account against Zimbabwe at Hamilton on February 15. They should be well capable of seeing off their neighbouring minnows without him, which then gives De Kock roughly nine weeks from here to be ready for the first SA “biggie” against India at Melbourne on February 22. Given his youth, with a bit of luck the Lions player will comfortably beat the longest scenario offered for his absence from the Proteas’ plans; remember also that the World Cup is a notoriously elongated event which sees semi-finals only on March 24 and 26 respectively and the showpiece fixture on the 29th. That said, Andrew Hudson’s national selection panel will inevitably be thinking already about alternative, bat-capable glovemen – despite the assuring possibilities offered in the department by senior batsman AB de Villiers – for the various one-dayers against the West Indies and then perhaps also into CWC 2015. It is hardly a secret that the multi-talented De Villiers cannot be too over-exposed to wicketkeeping because of occasional flare-ups of a troublesome back, and his blistering strokeplay is so vital to both the Test and 50-overs teams. Back-up names that come to mind in a limited-overs context include the particularly appealing one of Morne van Wyk, if huge experience and prior World Cup exposure are to be factored in, plus Dane Vilas of the Cobras and the Titans’ Heino Kuhn who has just scored 132 and 44 in a Sunfoil Series match against the Knights in Bloemfontein. Particularly smart behind the stumps, Thami Tsolekile is often on the fringes of the Test side, but is less of a factor at limited-overs level as a batsman, where he averages a humble 21.90 in List A cricket. Of more immediate concern, however, South Africa have to get their team-composition ducks in a fresh row now for the second Test against the shell-shocked Windies at St George’s Park from Boxing Day. The speedy way in which they suppressed the tourists at Centurion, with the Test ending well before lunch on day four and West Indies lasting only a total of some 103 overs at the crease in the match, suggests De Villiers can comfortably retain the ‘keeping chore for the remainder of the five-day combat – he’s already looked in fine form, including one splendid, goalkeeper-type high diving catch off Steyn’s bowling on Saturday. That leaves the question of who comes in for confirmed absentee De Kock in PE? The most obvious solution to this writer is for left-arm spinner Robin Peterson to simply slot in for him – a slow bowler is essential for the Friendly City – and this would only slightly compromise the batting strength of the SA line-up which plundered 550-plus in a lone innings at SuperSport Park. SuperSport commentators Michael Holding and Kepler Wessels argued with some justification afterwards that in modern Test cricket, four specialist bowlers tends to be enough. Under that scenario, the steady Kyle Abbott – who really deserves a bit of a run in the side – would also vacate a place for the second Test, thus giving Temba Bavuma an intriguing opportunity as first black African batsman to turn out for the Proteas. But my own reasoning for fielding a five-strong specialist attack in Port Elizabeth would be to curb the risk of any over-bowling for the key frontline trio of fast bowlers (Steyn, Vernon Philander and Morne Morkel) with World Cup considerations not at all far up the road. St George’s Park can be a slightly tougher place for seamers to regularly get wickets, and there have been niggling little injuries already at Centurion for both Steyn and Philander. Keeping Abbott in the mix would help ease their load, in what is a congested Test itinerary against these opponents, with the third Test at Newlands separated from the second only by two days if the middle clash goes the full distance.